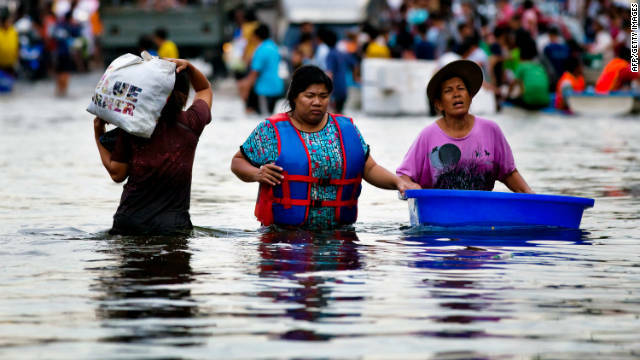 Thailand has been struggling with heavy floods since July of this year stemming from the seasonal monsoon, reminiscent of the devastating floods in 2011 which had forced some world-leading manufacturers to halt their operations at the time, according to ChemOrbis. Although the flooding doesn’t appear as devastating as in 2011, 29 of 77 provinces in the country were hit by floods this year while 1.7 million citizens were affected, reported media sources. An increasing number of players in end product industries and polymer markets in Thailand expressed their concerns about the situation this week now that the floods have hit an industrial area in the capital Bangkok and caused some companies to shut down their factories. Two foreign companies had to shut factories that produce electronic spare parts at Chonburi Industrial Park, according to media reports. Siam Cement Group (SCG) reportedly stated that they expect a slight drop in this year’s revenue from its original forecast as flooding started to hit sales of construction materials. Local polymer markets, particularly for PP, have been affected by the disaster with players reporting slower trading activities amidst hesitant purchases. Local PP producers and distributors either maintained prices or reduced them to entice better buying interest, players report. “Although some producers lowered their offers, activities remain slow. Buyers are cautious about making fresh purchases as their end product demand is not doing well amidst flooding concerns at the moment. On the other hand, there might not be further price cuts from producers, as we heard, based on some turnarounds in the last quarter of the year,” a distributor commented. “Demand in the local market is very slow as buyers are not interested in stocking up. They need to be cautious about the flooding situation in some parts of the country which may affect their business and even the overall economy,” another distributor said. According to news that emerged a couple of days ago, floods are hitting a major industrial area, Amata Nakorn, he mentioned. A distributor reported that the market is very slow as demand from downstream markets is not doing well. This is because flooding in some parts of the country, especially in industrial areas, is weighing down on the sentiment. “Our customers are still voicing lower buy ideas even after our supplier stepped back from its list prices recently,” he added. According to ChemOrbis, a woven-bag manufacturer reported having sufficient inventories which would last until early November, adding that they have no plans to purchase taking the uncertain market outlook into account. “We received slightly softer PP offers this week with respect to the previous weeks. We attribute this easing to the fact that the market is very quiet. Players in Thailand are worried about floods in the east of the country at the moment,” he expressed.